#28 "Council of Thieves #4 - The Infernal Syndrome"
In the bowels of one of Westcrown’s most esteemed halls of power lies an unfathomable evil, a terror beyond all reason and sanity, shackled and broken by the magic of a lost archmage. For years this menace has laid fuming, endlessly testing the bars of its prison, gathering its hatred and planning its revenge. Now the machinations of a deadly conspiracy have weakened the chains of this nightmare’s bonds, and in their growing cracks rise the flames of the damned and the promise of Westcrown consumed in hellfire. Can the PCs infiltrate the labyrinth of a madman to put an end to an evil beyond even the heroes of legend? And what foulness would seek to ruin all of Westcrown by gambling with its very soul? 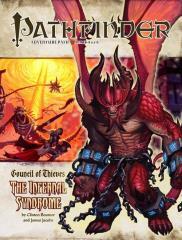 A Pathfinder Roleplaying Game adventure for characters of 7th to 9th level. The Council of Thieves Adventure Path is the first to take full advantage of the new Pathfinder Roleplaying Game rules, and works with both the Pathfinder RPG and the standard 3.5 fantasy RPG rules set.